Ragi Puttu is a healthy and filling Breakfast Recipe Packed with Calcium, Iron, Protein, Fiber and other minerals. Finger Millet is called as ragi in kannada, Ragulu in telugu, kezhvaragu or keppai in tamil, Marwa in Bengali & Nepali, Nachni in Marathi & Gujarati and mandika in Hindi.The natural fat content in ragi is lower than all other cereals, So People trying for weight loss can replace rice with Ragi. Ragi is rich in Calcium which helps in strengthening bones. It is an excellent source of natural calcium for growing children and aging people.Now we learn to make Ragi Puttu. 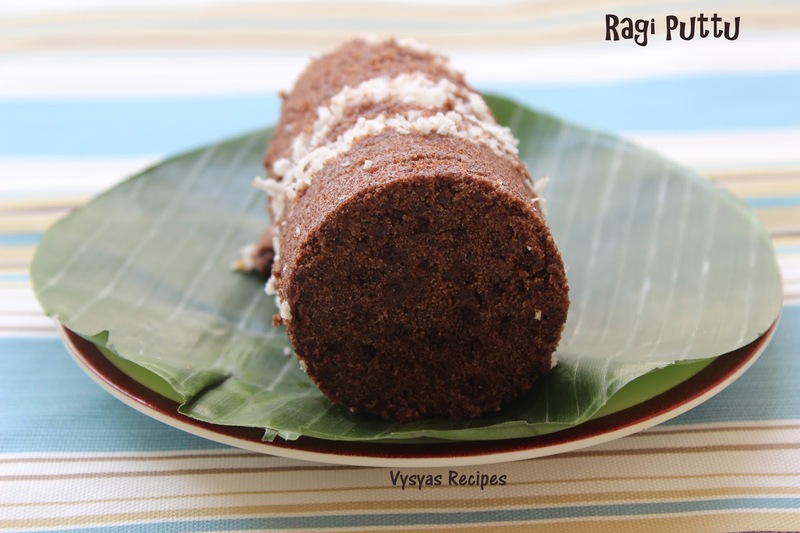 Sprouted Ragi flour/Ragi flour - 1 cup. Take a cooker, fill the cooker, with three-fourth of water, and cover the lid,let the water starts boiling, in a mean time mix the flour with salt water. 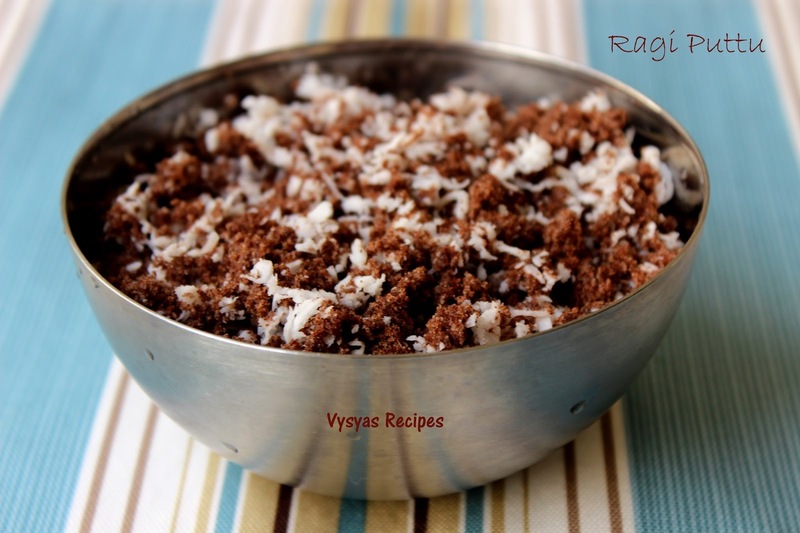 Take a Mixing vessel, add Ragi flour, sprinkle salt water, little by little. Flour should be in the form of Grated coconut or bread crumbs. When you hold the flour, you should get the shape. This is the right consistency of flour. if you sprinkle more water puttu becomes hard, or if you sprinkle less water, puttu won't be cooked. Mixing the flour with water is the very important step to make puttu. Allow it to rest for 5 minutes. Take a puttu maker, insert a round disc, at the bottom of puttu maker, then add 2 handful of Ragi flour, then 1 tsp of Grated coconut, again 2 handful of puttu podi and 1 tsp of grated coconut, do it alternatively, till you reach the end of puttu maker. Then cover it with a lid. When you get steam in a cooker,attach this puttu maker with cooker as shown in the picture, and let it cook for 8 - 10 minutes, in medium flame.you get nice aroma of Ragi flour & also you get steam from 3 holes of puttu maker. Then remove it from the cooker, and gently push it down with a metal skewer(which is a long metal stick given with puttu maker, shown in the picture).puttu comes out clean as shown in the picture. Then serve hot with kadalai curry recipe. Adding water to the flour, is an important step in making puttu. drizzle salt water little by little to get right consistency. when you hold it in hand, it should be in form of grated coconut or bread crumps. if you dont have puttu maker, you can steam cook the flour in idli plates, for 8 - 10 minutes. Serve with Kadalai curry or sugar. healthy and yummy puttu!! my fav! !